Stonehaven is a pretty seaside resort located fifteen miles south of the European oil capital of Aberdeen, Scotland. 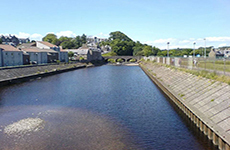 The town boasts many attractions such as its UK-unique art deco heated salt water olympic-sized open air swimming pool, linked via a promenade and illuminated Bay boardwalk to a bonny harbour with quayside pubs and Tolbooth Museum. There are various hotels, several cosy coffee shops and fish 'n chip outlets, beautiful woodland walks and ample sports facilities including a modern leisure centre with indoor pool and gym, and nearby skateboarding ramp, indoor and outdoor bowling, football, tennis, putting green and an international miniature radio-controlled Grand Prix race track. Other interests include a hogmanay Fireballs ceremony with an accompanying open air disco (admittedly hardly in angling weather! ), whilst the summer sees a renowned Folk Festival, Highland Games, Harbour Hi-Jinks and a vintage car rally to celebrate the achievements of Stoney's very own Robert W Thomson, the true inventor of the world's first pneumatic tyre. Stonehaven is also located between the mouths of the River Cowie and River Carron, both being summer/autumn spate streams with runs of migratory fish - mainly seatrout with some grilse and salmon. These start to gather in Stonehaven Bay from around June onwards, when some fine sport can be enjoyed by fly fishing or spinning from the foreshore, where the club holds the sole game angling rights. Given spate conditions at any time from then onwards, fish enter these two rivers (whose fishings are leased by the club) and can provide daytime action in high water to fly, worm and spinner, with seatrout responding well to a nocturnal fly or fly-and-maggot. The club also leases modest upper fishings on the River Bervie, some eight miles to the south. For stillwater enthusiasts, the SDAA owns one local well-stocked fishery and leases another. The SDAA was formed in 1937 by a handful of keen local anglers who had previously "informally" fished the local waters for many years. Membership grew steadily over the decades and now numbers around 160 adults, 25 juniors and 25 life members, augmented during the summer holiday months by several dozen visitor anglers, whose fishing on the two Stonehaven rivers is restricted to the beats from the railway viaduct to sea, and along the bay foreshore.